I LOVE this book. I loved this book before it was even in my hot little hands! 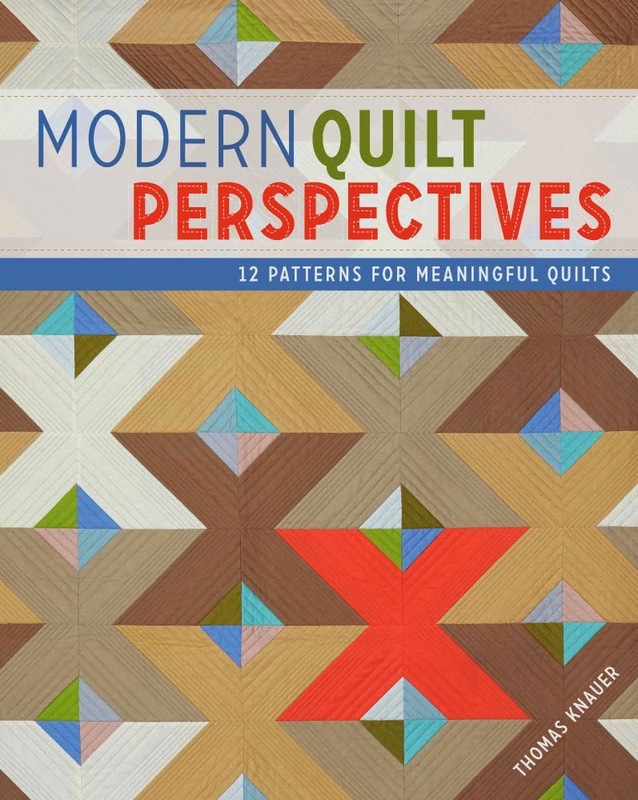 It was easy to fall for since I had been lucky enough to see a preview for the introduction to Modern Quilt Perspectives in an email. I was hooked on the concept Thomas was introducing. Putting your voice in your quilting. I happen to LOVE the challenge of a quilt block or learning a new technique. I see art quilts as something that is unattainable to me. I have yet to see myself as an artist...this book has changed my thought process. Thomas is a very passionate person. I need to restate that a little better and with a bit more emphasis...Thomas is a VERY PASSIONATE person. He is extremely real about who he is and all the insane brilliance that gives him his gifts. I love his originality, his passion, his ability to take the abstract and be able to explain it in lay terms to people like me. I need all the help I can get! Along with the tools and techniques he uses in his daily sewing, this book is filled with very real life issues from anyone's life to Thomas' personal life. His quilt Mitosis is an example of his personal life being represented in a quilt. In this beautiful simplicity the " The clinical gray background only serves to set off the abundance of color, just as the doctor's office gives way to the extraordinary reality of a child. " Simplicity speaks volumes when you understand the story behind the artwork. The reality of this wonderful quilt is not as lovely as the one above. Excess is a memorial quilt to the victims of domestic abuse. I have had dear friends that were victims of domestic abuse. This quilt speaks to me and hopefully to you. The 1,600 squares represent a woman's life lost to domestic violence. Putting a voice to a situation, like this one can help. Quilting arts can make a difference by giving a voice. I have learned that quilts do not have to be overly complex to convey meaning. I have to add in this fantabulous quilt that was pieced by Audrey Bidwell ( Blue is Bleu) Split Personality. It is rather drool worthy. Bridging the Traditional to the Modern, having them coexist and have a cuppa jo together is a thing of brilliance! Thomas is great at brilliance! There is so much more in this book than I can even begin to possibly share. It is really more like a novel with epic quilts thrown in. It is a must have for any collection. 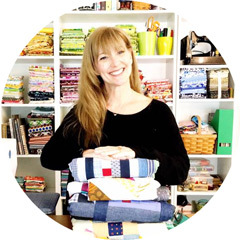 "I am of a new generation of quilters who did not come to quilting through a relative, friend, or indeed anyone with whom I had an immediate local connection. My community is first and foremost global; my conversations occur on the internet though various technologies. Most of my lessons have come from YouTube or other online tutorials. This virtuality, though, does not make my relationships any less real; we share our creative and personal lives together as we learn from each other and exchange the things we make. 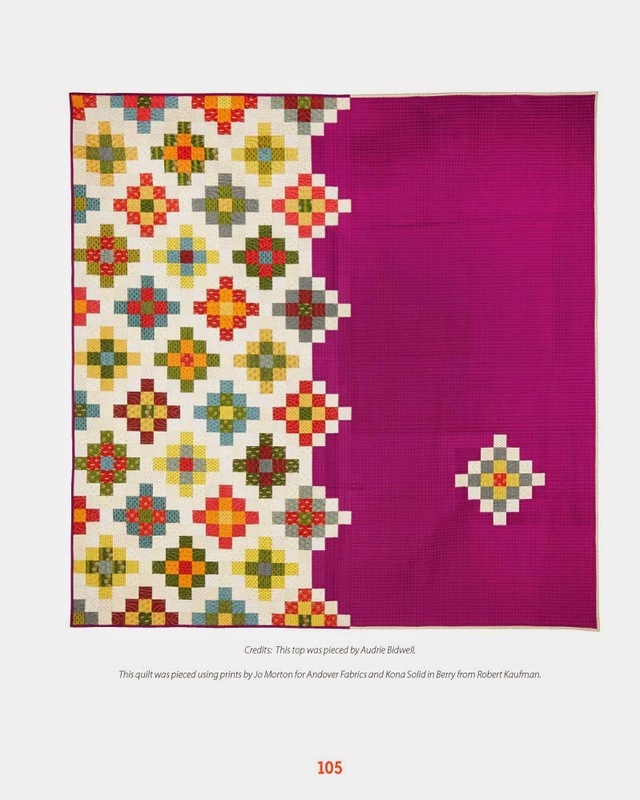 As such, the core practice of quilting has changed vary little over the centuries." Thomas is without a doubt an inspiration to me both artistically and personally. I love him and I love his choice in footwear too! 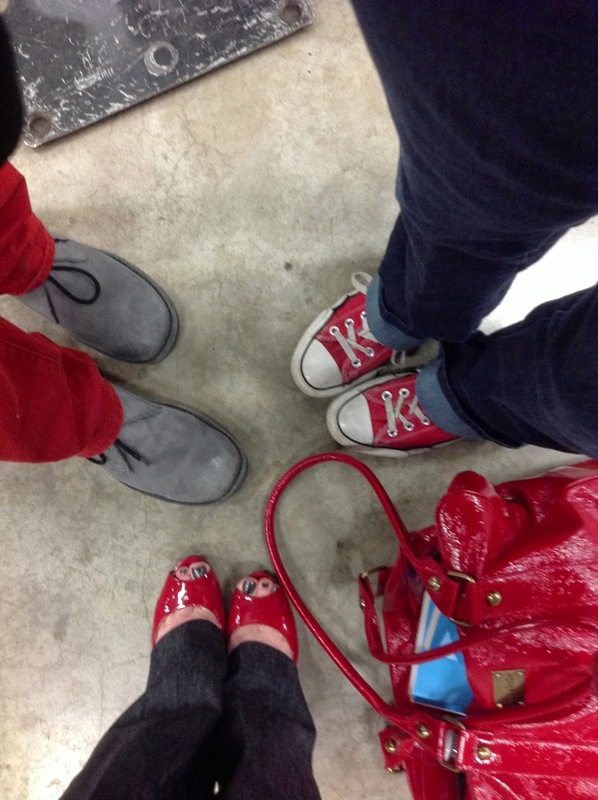 Gray Doc Martins... COOLNESS! To show how much I support this fantastic book, I am having a giveaway!!! I want to share with you a hard copy of Modern Quilt Perspectives and two large spools of Aurifil thread! The book sounds great!! A statement quilt....I have made quilts for graduation representing the high school and what the student was into during high school...like basketball. I have done t shirt quilts for young men to take away to college as a memory quilt. So; the statement was, I guess the school and the year. I probably would not make a statement quilt. my quilts are mostly for kids or young adults and about something they like . I also like mitosis but, am unsure how it represents mitosis. and I love the bar code. I feel like I made a statement quilt recently. I made a quilt from a little girls clothes, she is a special needs child and it was very very special to her mommy. If I made a statement quilt, it would be in support of something that I am passionate about --- but I am passionate about a lot of things so it would be hard to choose! Yes, I would. Maybe something about animals. I think all quilts are statements - some just louder than others. I do have some bolder ideas in my mind but have yet to fully formulate the approach. HELLO,yes I might and it would be something about "Friendship" > a very neat wallhanging! Thanks for sharing some neat thread! I love that quilt Split Personality. Looks like a fun book. I don't know if I would or not. I tend toward emotional giving in quilting. If I did it would probably be the need for kindness in the world. Not terribly challenging, but I'm pretty passionate about that. 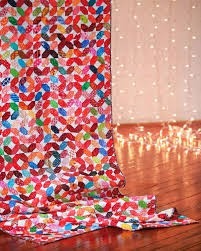 I'm am working on a statement quilt now for my sister out if fabric used to decorate for her bridal shower.
" Would ever made a statement quilt and, if yes, what would it be?" This is something to definitely thing about. I tend to make quilts that speak to me (and my design) or that teach me a new technique (or 2). Basically, I make stuff that I like and that is pretty. But I should definitely try to add some meaning to my quilts. THANKS for asking this question AND for the Awesome giveaway. I haven't made any quilts specifically to make a statement. Maybe I will someday. I do feel that all the quilts I make for gifts make a personal statement that "I care enough about you to make this quilt for you to enjoy". I would make a statement quilt and have been thinking about making one that is a tribute to some of the amazing and talented women in my family both past and present. I have been thinking about this a lot lately and would love to leave a legacy through my quilting. I am passionate about child hunger and human trafficking but have not firmed out any design yet. Thank you for the inspiration. This is a good question... I've only made a couple of statement wall hangings with the word LOVE. But I don't think this isn't exactly what you're talking about... So to decide quickly my statement would probably be: It is what it is! Great give away!!!! I think I will make a statement quilt!!!! It will be awhile!!!! Knowing me I will go through a few million thoughts before I decide on it!!!! Just the way I am!!!! I like the idea of statement quilts. I think the Grandmother's Choice Sampler by Barbara Brackman was a statement about women's suffrage and equality and I made it from my very personal stash. Hi Kim! I love the quote you posted, and along with your review, I am interested in reading this book. Like Thomas, I am the first person in my family to quilt, and although I have since joined my local modern quilt guild, my initiation into modern quilting was entirely from blogs. Thanks for sharing! I have made a statement table topper for my school. I could easily make a quilt. I think I would but not sure what it would be. Thanks for the giveaway! I would probably make a statement quilt if something inspired me to do so. So far that hasn't happened. I have no idea what that inspiration might be - perhaps something about accepting those that are different. I do have strong feelings about that. I probably would make a wall hanging rather than a full sized quilt as a statement quilt. I would make it for some charity that I'm passionate about. Thanks for the review and the giveaway. Yes, I think I would make a statement quilt! Thanks for the question because you have my mind racing . . . I WILL be purchasing the book for inspiration!! Such great giveaway. I have ordered mine. Always need more thread. I've never thought about making a statement quilt before....but if I were to make one, I want it to be an encouraging one. Thanks for the question! Someday I hope my originality will bloom and i will come up with a statement quilt of my own. Thanks for the giveaway! Every quilt I make is a statement. A statement of who I am as a person and artist, and a statement of my relationship with the recipient. I would probably make a statement quilt about hunger or literacy. Those two things really get to me. I'm new to all things sewing, so I'm learning what a wonderful world quilting is. Thanks so much for your blog, the inspiration keeps me creating! I'm a brand spanking newbie quilter, am just learning about different blocks and trying to achieve perfect scant 1/4" nested and spun seams, but I'd make a quilt that told the story of the journey from M.R.I to hospice, and the fantastic, unstinting generosity of the McMillan nurses who support those who prefer to spend their last days at home. I'd piece the centre block to be a Pink ribbon looped around the bright Yellow Daffodil that is the symbol of the McMillan nurses in the UK, not sure about the rest because I'm not good enough yet to even dream about creating my own quilt. Come to think about it though, that would be a great symbol to use in a place mat or coaster wouldn't it? Yes - I've make statement quilts. I like to support a local dog rescue that I'm very connected with and I've made statement quilts for them. Great review Kim. I have not made a statement quilt but have been following Thomas for a while and he really gets you thinking about things on a whole other level which I LOVE! Isn't every quilt we make a statement quilt? There is usually a reason behind it's creation... or maybe I'm on the wrong track. I can think of one idea that I have had for a few years now, but haven't had the courage to start it, and it would be about.... interconnectedness? (Is that a word LOL) Thank you for sharing your thoughts on this exciting new book! I think I would make a statement quilt, I have been part of a group project for disabled vets. Yes, i've made a statement quilt but my statements aren't profound. Mine was a turquoise, red & purple quilt with black background and its name was "My Favorite Colors". Most of my quilts are statement quilts--to me, anyway. I like my work to express HAPPY. I like finding the happy of every day. I don't mind rain, snow, storm, whatever. I can find a happy to be happy about. I enjoy finding beauty in small things like the symmetry of the dots on a ladybug or how overcast skies and snow make the bark on the brown tee trunks look like rich chocolate and the lichens glow with a green one doesn't ordinarily notice. ive never been so excited to READ a quilt book! i think a statement quilt sounds intimidating...what if no one understands?? I think all quilts make a statement in one way or another. Foremost, they are a statement that says I care enough to put thought and energy into making something that is beautiful for the sake of beauty. Quilts are either functional or art and either is a statement of love and energy. I would make a statement quilt. As to what, I'm not really sure. I made a quilt with the breast cancer awareness line and preseted to my doctor who has cancer. Don't know if this qualifies,. I am not sure if I would make a statement quilt or not. It is something to ponder, though. Thanks for the chance to win! I would love to make a statement quilt but don't know what type. Maybe the book would help me come up with something unique?! I don't think I would make a statement quilt anytime soon, as I am a beginning to the sewing world, but I would love to try someday! I'm working on one right now, and have another in my head. The one I'm wanting to make is a tribute to my dad, who is very ill. I'm making a quilt to gather donations for my dil's niece. She has Cystic Fibrosis ~ she's only 2 years old and the things she has to go through every day are not what any little one should. I'm going to be doing a giveaway with the quilt to raise money for a donation for CF. I would make a statement quilt, if it was to raise money or be displayed. The book should provide inspiration. I think every quilt I've made is a statement quilt of sorts. Even if the statement is simply: "I Love You, so I made you a quilt". I think my quilt would say, "Find joy each day"! I don't think I am at a quilting technique level that is good enough to make my own "official statement quilt ". I hope to be able to make one someday. I have never made a statement quilt. But it does sound like an interesting concept. If I did make one, it would have to be about what quilting has meant in my life. Inspiration, challenge, excitement, and most of all friendships. I like quiet reflective statements and am trying to include more of that in my quilts. I did make a statement of love quilt for my husband for our 5th wedding anniversary! I would make a love to make a wedding ring quilt for my Mom who is 90 years old this year. She loves the design. I haven't made a statement quilt, and won't until I feel more confident about my skills. I would like to make one, and probably will someday. All quilts I make are statements of my freedom, though. I am free to create and play and buy fabric, and it's impressive to me that I allow myself those luxuries (it was not always so). After reading reviews for this book Ithink I would like to try a statement quilt. I have a little idea running around in my head. Being from a military family I think it will be about service and sacrifice. I think the quilt I made my daughter upon graduation of college is a statement quilt. It is done in her school colors - maroon and orange. And yes, that WAS a challenge! Thanks for the great giveaway! There's one in the works, currently collecting lots of prints for it. Thanks for the opportunity to win what appears to be a great book! I suppose, it won't happen soon if at all. I mean in the public sense. Who knows. Every quilt is statement quilt in a very private and delicate way. Especially when it is made for specific person. You spend hours and chose all the elements that reflect what this person is /or can be/, to make them feel good and be happy.. giving them a hug every time they touch the quilt. If I was going to make a statement quilt it would be for breast cancer. I read an article years (decades??) ago and the artist made two quilts with hundreds of bras, quilt one, a light colour made of bras with 2 fully padded cups and the other dyed grey, made with 'empty' cups. The image of those quilts have stayed with me for ever. I would and it would be about something positive as there is so much sadness and pain in the world already. I would make a statement that it is OK to get older! I liked the part of the quote that spoke about the global quilting community, but quilting hasn't really changed. I agree. The global community definitely makes it more fun. As for statement quilts, I tend to enjoy more traditional designs, and the quilt needs to mean something to me. I realize it's art, but I'm not doing it for others, I'm doing it for me. That's my statement. I never thought about making a statement quilt, but now I'll be thinking about what statement I would like to show on a quilt. The majority of my quilts are made as a personal statement to the recipient. An example would be a comfort quilt for a friend that had breast cancer. It was called "A few of my favourite things"/ the blocks were of the various things she liked such as her dogs, flowers, music, scripture verse etc. Would love to read the book for inspiration. Sure! Perhaps something about nature. I've not made a statement quilt but like the idea. My quilts tend to be more story than statement. Thomas's book sounds intriguing. Okay, so I know this is a bit of a cheeky answer, but each quilt I make (that are not commissioned), makes a statement. The statement is that I love the recipient, that they are important enough to me to give my time, effort, thought, and money into a quilt for them. I'm not the only one, either, for all quilters make this statement. And personally, I think it's the best one any of us can make, whether it's for the newborn a few doors down from you or for the people at the local homeless shelter or for a very sick child. Love. That is the statement we make each and every day with our passion. I have made a statement quilt dedicated to my love for Lake Maggiore, near where I live. Many times have I needed to take in the beauty of this lake to find peace of mind in difficult moments. To be honest, I don't think I would ever make a statement quilt. But who can predict the future? Maybe I'll be inspired when my daughters grow up. Thanks for the giveaway. I'm not sure. I think it depends on the statement. I can see it happening, maybe. Maybe something religious? A statement I would make is for happiness. I would like to somehow make a quilt to put a stop to breed specific legislation or stopping animal cruelty. I made a statement quilt a few years back for my teenage granddaughter. She was having an extremely hard time with family and friends and was feeling very unloved. I set about to make her a quilt. Not just any quilt but one that had hidden messages for her. At first she found it to be a very pretty quilt made in our favorite colors of black, white and turquoise. One day she noticed that I had my favorite machine quilter finish the quilt in strings of phrases of how her family and friends felt about her along with the names of the persons who shared them with me. It was a real eye opener for her. It has been her go to quilt whenever she is feeling down on herself. The first quilt I made last summer was a granny square. The block represents me as the center, the first ring around the center represents my mom and the third ring around that represents my maternal grandma. My mom had died earlier that year and she is my sewing inspiration. My grandma died when I was a little girl and she is my quilting inspiration. I have never made a statement quilt. The quilts I have made are scrappy quilts for my family. Yes I would make a Statement Quilt, having already done so. The next one will be a reference to my Darling departed Mother and her wonderful correspondence. I have never made a statement quilt, but I am a rather new quilter and still learning so much! This book looks fabulous, I'm loving the modern quilts out in the world. I don't think I could make a statement quilt - I wouldn't know what to say. Thanks! I have made personal statement quilts and will do so again. One that I made (very nontraditional) was called "He Never Sent Me Flowers" about my relationship with my former husband. I think it would be harder to make social statement quilts, but there is certainly plenty to comment about in our world and way of life! 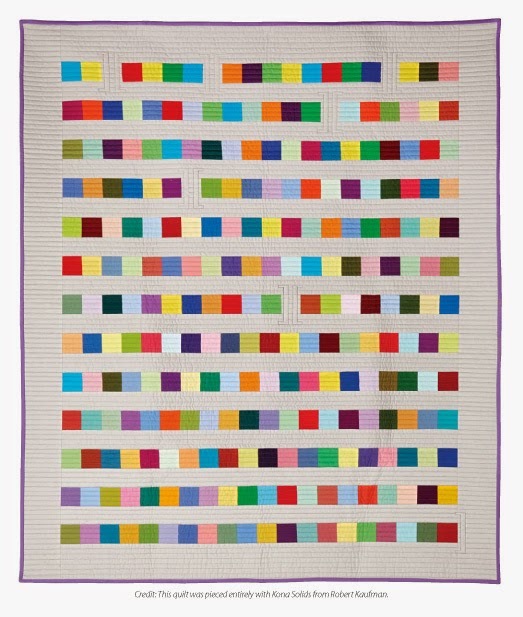 I find statement quilts interesting, but am not sure that I would ever make one-but, things could change! Making a statement... definitely! But it's hard to decide. I did a lot of work with African orphans several years ago and would love to put something together honoring them with the fabrics I bought on my trips. Each quilt is a statement - of the maker and their talent and of the relationship with the recipient. It doesn't need to be more than that. Thanks for the awesome give away! The statement in my quilts is that I like a bold, simple approach. I am thinking the "modern" movement is in line with my thinking so may move more in that direction. Wow, I love the conversations this book is starting all around the Quiltosphere! I think, for me, that I work best when I'm not trying to make a statement, but I've achieved a kind of flow while I work. In retrospect, and often through discussions and critiques, I can learn so much about where I was at a particular time by looking at my quilts. And I guess that's statement-y in its own way. Thanks for the opportunity! I have not made a statement quilt, and probably would not. I tend to make very scrappy quilts. Yes, I have and would make statement quilts. I'm working on a mini right now that falls into that category. It is a small version of the HRC logo, and the solid parts are made up of "plus" blocks. It's a quilt about marriage equality. I do like quilts with meaning behind but I haven't made one yet. I might though. Thanks for your review and giveaway. I think it's a process. I might begin with a purely creative purpose, then the meaning develops as I go..or the finished quilt just speaks to me of something. answer is probably, maybe, lets see when I finish my next quilt! I doubt I'd ever make a "statement" quilt but seems like all quilts say something about their maker and/or the recipient. Thanks for such a lovely giveaway! My sister passed from cervical cancer in 2010. My statement would be: "Get checked for HPV. If you have it, then get your PAP smear YEARLY instead of the newly recommendation from the government for 3 years." Cervical cancer happens because of a few deadly strains of HPV. But 20million Americans carry one of the 80 something strains. She didn't get checked for a few years and died because of it. It would incorporate the color Teal, which is the color for cervical cancer. A Statement, mmmm...I kind of think I like to just make pretty things and make them for a reason, but to make a statement, not sure about that. Would love to read his book though. Thank you for sharing the moving statement quilts. If I were to make a statement quilt I think it would include marsh birds and wildlife. We have a beautiful marsh in our area and there is a move afoot to put a road through it. I hope that never happens. I live in a small and very old town so if I made a statement quilt I would design it to reflect the history of this town and to encourage people to continue to make history. I absolutely would make a statement quilt. The first quilt I was exposed to was a mini quilt a friend was given after she had a brain tumor removed. Everything about the quilt was inspired by her life and loves, and that has stuck with me and inspired my philosophy on quilting. I'm in the process of making a statement quilt using the Ghastlies for my brother who loves all things Edward Gorey and Charles Aadams! I haven't done that kind of quilt yet. I would have to get past my traditional block quilting. Thanks for the giveaway! I feel like all quilts are statements in their own way. Even if that statement is simply "I care about you and dedicated my own time and talents to make you something special". I think every quilt I make is a statement of I Love You to someone. It is a Hug for someone who needs a hug, a picture on a wall for someone who needs a thing of beauty and a part of me, flaws and all, every time I sew. a statement quilt would make a good addition to my guest room! Most of the time my quilts are made for gifts and they represent love and hugs for the recipient. I think that is a statement, not necessarily one that others might recognize, but important nonetheless. I had not thought about a statement quilt, but now I have some ideas and they revolve around maps of my city. Something using all of the old hoodies that mean a lot to me but I don't wear anymore. I made a statement quilt for my boyfriend a few months ago. It's one that makes people laugh - a crazy pieced camel with "guess what day it is..." embroidered underneath! I can't wait to see this book in person, and who would refuse Aurifil?